Things are going great in Mbanga Cameroon. The last few weeks were filled with many activities and celebrations. Brother Todd Crayton taught the final short course entitled, “Marriage and Family.” Following the class, there was a great celebration of marriage along with the registration of the marriages with the country of Cameroon. The couples had already followed the traditional marriage customs but took the opportunity to register with the state and celebrate with the church. It is always great to have souls added to the kingdom. Pray for Juliette as she grows in the faith. The water is flowing well in the campus from the water tower. An addition filter for drinking water is not necessary but caution is always a good measure. The outdoor toilet is for the congregation and visitors as the inside toilets are reserved for the students. The soon to be graduates were gave a defense of their research to the staff. They did a great job. We are proud of the students and staff of BVBIC-Mbanga. The Bear Valley Cameroon Alumni Association met in Mbanga. It was great to see about thirty graduates some from each of our schools. They meet quarterly, if possible, to do mass evangelism together. This was a special meeting close to graduation to elect new officers. The campus is getting some new looks with new paint, tiles, room labels, and sign boards. It is good that the people of Mbanga can follow the new signs to the building. Graduation and matriculation went great. We graduated 9 and admitted 16. The school is growing. We will have 6 students from the country of Chad and 4 students from the far north of Cameroon. We are seeing our dream of spreading the gospel into French Africa coming to life. The chief of the village thanks us for the many amenities like a gravel road, a night light, and available water. He congratulated the students and staff for their success and influence. 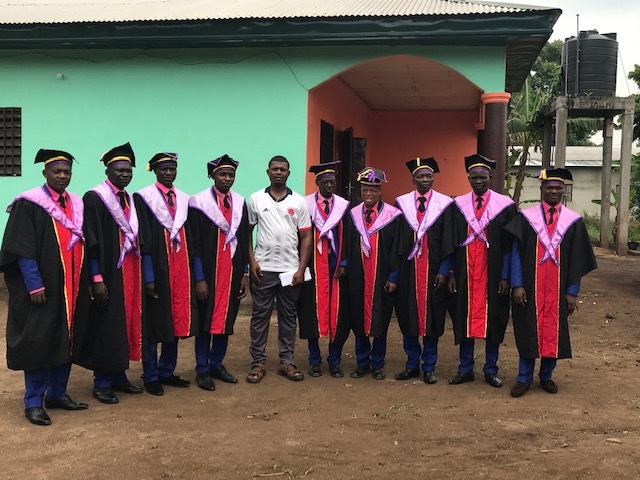 The students received an Advanced Diploma in Biblical Studies and their wives received a Certificate of Completion of the Preachers’ Wife Program. We have sent them forth to win souls and nurture congregations. I enjoy taking off my coordinator hat and my teacher hat and putting my brother in Christ hat to enjoy door to door evangelism with my brothers. It is such a blessing to go to work with these guys in the field. Even those who a starting their two years of training are already able to give a great defense of their faith. As always brother Todd did a great job of teaching and preaching. Brother Clinton was converted in the Mbanga prison and is now a student at Wotutu. He was assigned to evangelism in Mbanga. He is helping some brethren find a pair of glasses that will allow them to read their Bible. Brother Clinton’s wife Juliette is the one that was baptized by Todd. I went to the school where she is the discipline master and greeted many children and teachers. We pray that these community connections will also help in the winning of many souls. Posted on March 26, 2019 by Keith Kasarjian and tagged Extensions Cameroon Mbanga.